Find out if your flooring contains this banned material—and if so how to deal, whether you aim to remove it, cover it up, or leave it alone. Asbestos, a heat-resistant fibrous silicate mineral, was a common element in construction materials due to its resilient, durable nature—until the 1980s, anyway, when it was banned due to the discovery of considerable associated health risks. But its ban from production didn’t necessarily mean that all products, including floor tiles, had been ripped out of homes or even completely removed from shelves. 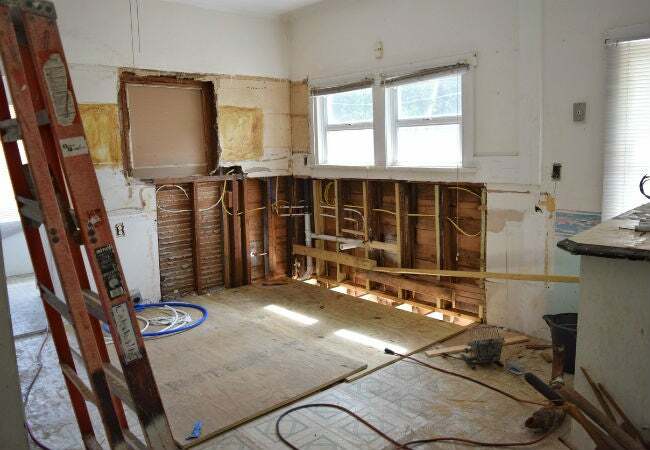 For this reason, many homeowners sit unsuspectingly on materials that can be especially hazardous when unearthed during removal and renovation. If you live in an older home and are concerned that your you may have asbestos floor tiles, keep reading. We’ll fill you in on asbestos hazards and explain how to determine its presence, as well as what you can do to keep your family safe. 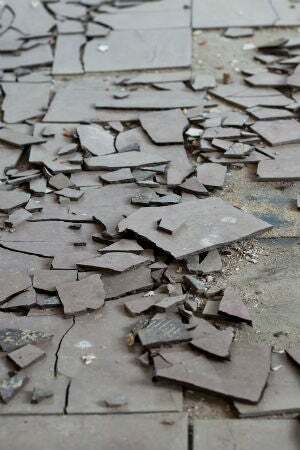 Asbestos floor tiles will not release toxic fibers and pose a health risk unless they are disturbed. Sanding, sawing, drilling, or tearing the tiles out, however, can release fibers into the air where they can be inhaled, so caution should be taken to not disturb them. If you must remove them for a remodel, be sure to follow one of the safe removal methods described below. The definitive way to find out if tiles contain asbestos is to have them tested. You can either engage an asbestos remediation expert or obtain a test kit—for which you’ll remove a flooring sample to mail to an asbestos-testing lab. Asbestos testing kits are available in DIY stores and online for between $10 and $45, but be aware that you may be charged an additional $25 to $40 fee to process the sample at the lab. Kits come with instructions on how to collect the sample and include disposable gloves and a dust mask to wear during collection. Before taking a sample of your flooring tiles, call your local building authority. Some localities restrict asbestos testing to licensed asbestos remediation experts. Professional testing can run $350 to $800, depending on whether other materials in your home are tested at the same time. • Your home was built pre-1980. 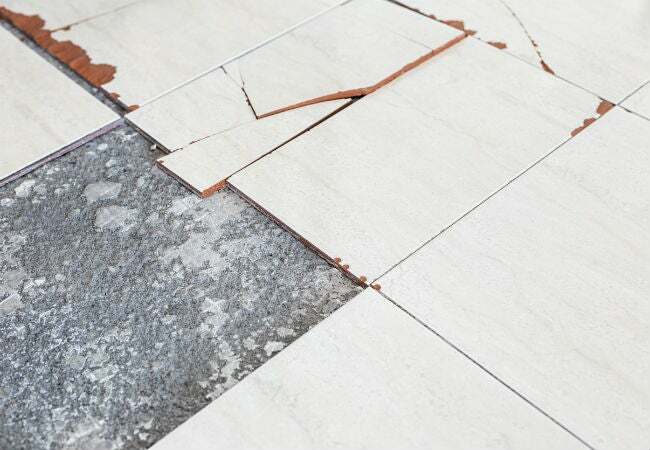 If floor tiles were installed between 1920 and 1960, there’s a good chance they contain asbestos because most flooring tiles manufactured during this period did. If the tiles were installed between 1960 and 1980, there’s a slight chance they contain asbestos. • The flooring tiles are 9-inch, 12-inch, or 18-inch squares. The most popular size was 9-inch by 9-inch, but the two larger sizes were also installed in many homes. • The tiles may appear stained or oily. Over time, asphalt—which was a main ingredient in asbestos tiles—can degrade and cause the tiles to look grimy or discolored in spots. • Some of the flooring tiles have come off and you see thick black adhesive underneath. Black mastic, also known as cutback adhesive, was commonly used to glue flooring tiles down. This type of adhesive was asphalt-based and most likely contains asbestos, whether or not the tiles themselves contain asbestos. One of the best ways to deal with asbestos tile is to leave it in place and cover it with new flooring. The old tiles are relatively thin, around 1/8-inch thick, so installing new flooring on top will not appreciably raise the height of the floor. New vinyl, laminate flooring, hardwood, engineered floating flooring, and carpeting can all be successfully installed over asbestos tiles. Even ceramic, slate, and stone tiles can be installed on top, as long as a fiber-cement backer is installed first. Note: If you install new flooring over the tiles, be sure to notify your real estate agent when you sell your home. This will give the buyers a head’s up so they don’t start tearing out the tiles should they wish to install new flooring. The only instances where you can’t leave asbestos floor tiles in place is if you intend to refinish the wood flooring beneath or otherwise disturb the tile during a remodel. Aside from that, some homeowners simply aren’t comfortable having asbestos tiles remain even if they pose no health risk. While some states and communities prohibit the removal of asbestos flooring, many areas do permit homeowners to do so. The safest removal option is to have an asbestos remediation contractor remove the old tiles at a cost of between $6 and $10 per square foot, depending on where you live, the condition of the tiles, and whether local regulations require extra steps to protect the rest of the house. DIY removal is cheaper because no labor costs are involved. You’ll pay $3 to $5 per asbestos disposal bag, which is recommended for safe disposal. A single 15-gallon poly-bag, designed for asbestos disposal, will hold approximately 20 square feet of demolished floor tile and associated debris. You may also have to pay a hazardous waste disposal fee, which ranges from $35 to $75 or more, depending on the facility. • Wear a respirator mask, goggles that form a seal around your eyes, a hat, and old clothing you will dispose of when the job is done. • Shut off your HVAC unit and seal off other areas of the home to keep asbestos fibers from contaminating other rooms. Tape plastic drop cloths over doors, floor registers, and return air vents. • Keep a pump sprayer filled with water handy, and spray down the floor as you work to reduce the risk of airborne fibers. • Use a steel floor scraper to pry up the asbestos tiles one at a time. • Dispose of asbestos floor tiles in approved asbestos disposal bags and seal each one as directed. • Clean up any remaining bits of adhesive by scraping them off the subfloor while keeping the floor wet, and then scooping them up and putting them in a disposal bag. • Wet mop the floor when you’re done and then toss out the old mop head. Replace it with a new mop head and rinse out the mop bucket thoroughly.